We (Dane Braun and the Discover Tatooine team) are dealing with the locations of the fictional planet Tatooine from the Star Wars saga and its locations in Tunisia. Among other things it is about all kinds of information which is necessary to visit the locations. We know about typical Tunisian conditions, about the exact locations including GPS coordinates, have comparative footage from film and original shots and present a lot of other things to tell about Tunisia. We also report on our remediation of the Lars Homestead dome. This dome was renovated a few years ago by the “Save Lars Homestead” campaign, but has since been forgotten and slowly decayed again. Since we don’t want to let this iconic piece of film history fall into disrepair, we have made it our task to preserve it for future generations. We also regularly record the condition of the other film locations. Look forward to a powerful location trip on the FedCon. I am currently the Commanding Officer of the Rebel Legion - German Base Yavin. I am the initiator of the project Discover Tatooine. It was created by me to help people find the wonderful desert locations. In the last years I have visited all Star Wars locations in Tunisia several times. Thus I could acquire a large knowledge to everything and would like to let now other interested ones participate in it. Besides I know meanwhile many country-typical conditions in Tunisia, on which it applies to pay attention. 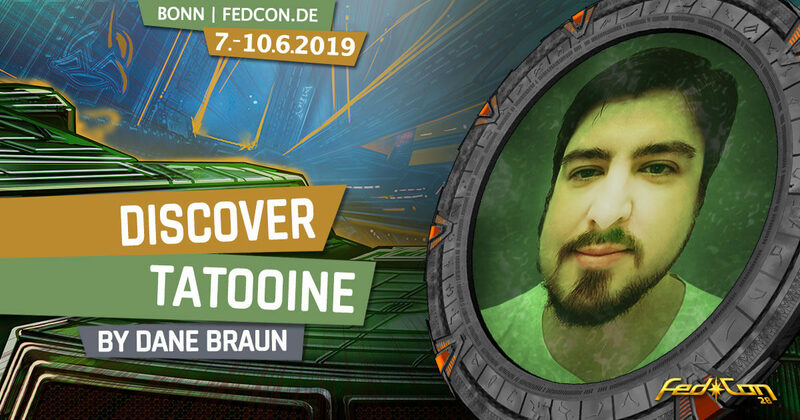 Regardless of that, I'm very interested in science fiction in general and look forward to the FedCon!